I like the idea of decorating the plain, of giving the simple more depth. I like functional art. Whatever that makes me, so be it. I like symbolism and the meanings conveyed in natural items and decorative invocation of the symbolic power of those items. In the same way, I want to live in a simple house and eat from my over-done, fanciful, renaissance-styled sterling flatwear. I know that may sound contradictory, but I think that we should have the beauty we want in the things we need, rather than having art knick-knacks or examples that can only be admired and never touched, held, enjoyed and used. Museums are wonderful places, and I love them, but I wouldn’t want to live in one. I prefer my home and my life to incorporate the beautiful into the everyday. With that said, I have found a white gold band I want to wear. It’s a simple band with an abundance of hand engraved detail on three of the four sides (it’s squared off). 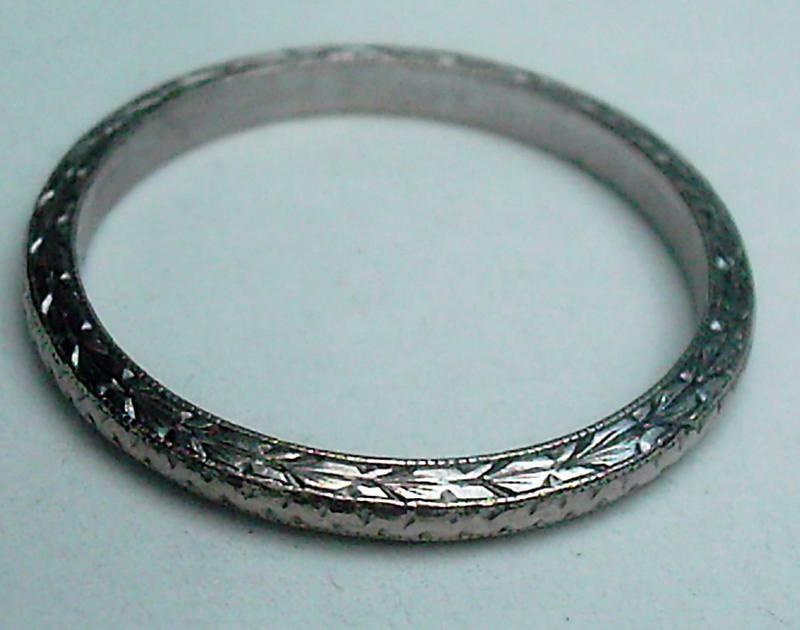 It’s a thin band, Edwardian era, 20K white gold and embellished with one of my favorite symbols — the laurel leaf. It’s my size and it’s simply lovely… and it’s available on eBay. I’ll take THAT as a sign! Creativity – Laurel was said to communicate the spirit of prophecy and poetry. Laurel leaves were commonly put under pillows at night to gain inspiration through dreams and its intoxicating properties are associated with prophetic and poetic inspiration. Cleansing Properties and Magical Attributes – Laurel leaves surrounded the temple of Apollo to cleanse the soul before entering. It’s associated with purification and was seen as a plant with powers of immortality. Laurel supposedly awakens awareness and past life memories, stimulates psychic awareness, health and the powers of divination. Peace and Protection – Today laurel is seen as a symbol of peace. It also indicates a power over the passions and is thought to protect from the influence of evil spirits and to give protection from lightening. Achievement – It has long been a symbol of victory. Laurel was given as a symbol to the winner in Pythian games. Masons consider the laurel symbol to signify the hopeful expectation of success in the search for the True Word. In the bible, laurel is an emblem of prosperity and fame. In Christianity it is said to symbolize the resurrection of Christ and the triumph of humanity. It is also the source of the word Baccalaureate and of poet laureate. Daphne – (Coincidentally, the name of my best friend of many years.) In Greek mythology, the nymph Daphne changed into Laurel to escape the pursuit of Apollo. So, yes, I think I’m going to bid on it. I may even combine my love and belief in the power of the spoken word and get the inside engraved with a special quote to create my own perfect poesy ring — and a recipe for peace, creativity and inspiration all rolled into one tiny band of gold. Just looking at it every day will probably remind me of all the things… all the attributes… I hope to achieve. And all of them are wrapped around the symbol of the laurel leaf as tightly as the laurel engraved ring will be wrapped around my finger. 47 Responses to "Laurel Leaves – Symbolism and Meaning"
I hope you won the ring! Thanks for stopping by Kelilah! I was looking up the meaning of Laurels because right before my mother in law passed away from a fight with cancer she spent a few weeks coming in and out of a very deep sleep. She was often telling our aunt that the angels were finishing her coat. Once she told our aunt that the coat was being made of laurels. I just thought of that again and wondered if there was any significance to it. I was very surprised to learn in your article that it meant “to cleanse the soul before entering”. Maybe before entering heaven. What a beautiful thought. Indeed it is! Thanks for sharing your story. It’s beautiful. You are more than welcome, Llora! I am in search of the meaning of my name and stumbled across your blog and I have to say i like your school of thought!!!! I am also a fan of usable collectables although i dont use my favourite tea cup as much as i like to as i fear it will not hold up to another round of superglue!! !lol but to the point the meaning of laurel is inspiring and seems to fit me extremely well I wonder how much of our being named at birth is devine appointment or that we just live up to our names meaning – food for thought!!! I don’t know if we are named (unknowingly) by our parents for the qualities we already possess, or if our name influences who we are — but I do believe that either way, it’s an indication of our “true” selves. Of course, my mother once told me that I was her “little angel” before quipping that it wouldn’t have seemed right to name me her little devil. Go figure. Hope to see you around WB again soon! Blessings. I am. I love the Internet! And it’s wonderful to put my thoughts out there and have discussions with amazing, new, like-minded people! Hello, I was doing a tarot reading and laurel was one of the symbolisms – very helpful thank you for you post. i live on street named Laurel, found your research really insightful. Sorry, I’m not qualified to say — I just do a bit of research on topics that interest me and share on WickedBlog from time to time. Best wishes! Thankz for the meaning behind this….Good looks in advance. Thank you for this post… I am growing a Laurel Bay plant and it is doing absolutely fabulous. I tried to grow one last year when I was in a failing marriage and the plant too, died. Since my divorce, I have been on an amazing journey into spirituality. I brought the new Laurel plant 6 months ago and I was curious about it’s amazing growth. Your blog really nailed it! Thank you again! I’ve just thought that if I had a daughter I’d call her Laurel, as your correspondent Patrick (15 April, 2011) did. Thanks for your help and inspiration! Many thanks. My son and I were discussing the meaning of Poet Laureate, and this was most helpful. On considering the aspect of purification and poetry, it occurred to me that this notion is most apposite. A poet needs to understand or ‘see’ without hindrance and then have the capacity to render what is ‘seen’ or understood into speech – words, metre and so on. I think T. S. Eliot spoke about the ‘shadow’ coming between the Idea and the utterance. True poetry is where the Idea and the utterance come together. Many thanks once again, you have got me thinking. I may have to start looking around for a laurel of my own. Thanks for stopping by, Hamish! I have enjoyed my laurel ring for several years now, but have decided that it will be one of the items I sell in my bid to live a life more simple. I probably won’t have it listed for a few days (maybe even a week with the holiday). Hi Angela! I too love engravings on rather simple bands. Engravings that are personal yet also symbolic of a deeper meaning. Ironically, this is how I stumbled across your blog! I’ve been searching for unique engraving ideas for my boyfriend and myself. In case you might share this interest, I found some neat ideas here with some nice photos as well: http://www.brilliantearth.com/news/romantic-ideas-for-personalized-and-engraved-rings/ Thanks again, I’m glad to have found you. Thanks for stopping by Laurie. I like your website. Keep blogging! Hello,am laurencia.Before,i ddnt knw the meaning of my name,but i knw now,means a crown of laurels.It really reflects that meaning and am so proud,thank you so much. You are quite welcome, Laurencia! I’m so glad the information was useful. Good luck on your paper! I know this is very old, but I saw a girl with a name similar to mine and had to comment. My uncle, who is from Israel, named me. The meaning in Hebrew is crown of laurels. But it can also be Arabic for “soul weary”. I was wondering where this young lady got her name… My uncle being from Israel it seemed the Arabic version or Hebrew works, be he himself said he meant it to be wreath of laurels… Guess it doesn’t matter, though. But hers.. Kalila?… Is a variation. Thank you for stopping by and chiming in on this post, Kaleah. It may be an older post, but I’m pleased that it speaks to you! My wife and I lost a cat that we had for 17 yrs. he was as a child to us and it was devastating! This past March as I woke up I said ” good morning Mr Button” to his picture by my bed as I do several times a day. However as I spoke to him a large circle formed around his picture and in this circle many laurel leaves appeared and started to move in unison. I turned a lite on and it disappeared, turned the lite off and it was back! There were several other events also..